I don't do a lot of work with databases, but in connection with a research project I got hold of a CD with a 30-meg DBF file on it - 74,624 records, 23 fields, total of field widths 414 characters. At first I tried copying the file to the hard drive and reading it with Quattro Pro. This was possible, but it was slow, and pushed the program to an intolerable number of illegal errors leading to shutdown. 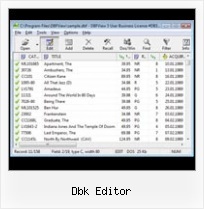 So I went on the net and searched for DBF readers, hit apycom.com pretty soon, read the home page and decided DBFView sounded useful and inexpensive, downloaded it, and have found it to be very serviceable. The program was easy to install, reads quickly from the CD-ROM drive, finds individual records reliably and quickly enough for my purposes, and in general seems like a tremendous bargain.